First Cardiological Clinic UMPHAT "G. Stranski" - Pleven, Bulgaria. Background: It is known that metabolic syndrome characterized by diabetes, hypertension, dyslipidemia, and central obesity is associated with the syndrome of early vessels aging, characterized by a change in elasticity of the vessel wall. The early manifestation of the metabolic syndrome in younger people in the modern society, leads to earlier manifestation of the complications of early vessels aging, and the combination of several risk factors is crucial and leads to acceleration of the vessels aging. Elastin is one of the main building blocks of the of the vessel wall. Its main characteristic is its elasticity, allowing the vessel to restore its shape after stretching or shrinking. Loss of elasticity is a key component in the pathogenesis of cardiovascular complications Materials and methods: A study is conducted on 62 subjects with metabolic syndrome without vascular complications and 42 controls. The main objective of the study was to compare the imunological markers of elastin degradation in both groups and to assess their relationship with the risk factors characterizing the metabolic syndrome. Results: When comparing the mean value of AEAb IgG in the control group and subject group with metabolic syndrome (respectively 0,45 / - 0.11 and 0.54 / - 0.29) statistically significant higher mean value of AEAb IgG in the group with metabolic syndrome, t = -1,85, p = 0.03 is observed. When comparing the mean value of ATEAb IgG in the control group and subject group with metabolic syndrome (respectively 0,45 / - 0.13 and 0.55 / - .43) statistically significant higher mean value of ATAb IgG in the group with metabolic syndrome, F = 6,83, p = 0.01 is observed. There isn’t a statistically significant difference in AEAb IGM and ATropoEAb IgM in both groups. In the whole sample AEAb IgG showed positive correlation with total cholesterol with a correlation Spearman coefficient r = 0,25, and p = 0,02, with triglyceride levels with Pearson correlation coefficient of r = 0,35, p = 0,001 and with LDL levels with Spearman correlation coefficient r = 0,29, and p = 0,006. In the whole sample ATropoEAb IgG showed positive correlation with LDL levels with Spearman correlation coefficient r = 0,29, p = 0,006 and with levels of total cholesterol with a Pearson correlation coefficient r = 0,33, and p = 0,001. The Correlations are described by regression analysis and the relationship is linear. Conclusion: It is proved that the AEAb IgG and AtropoEAb IgG are significantly elevated in the subjects with metabolic syndrome without manifested cardiovascular complications compared with the control group, whereas no difference in AEAb IgM and ATropoEAb IgM has been observed in the both groups. Key words: Metabolic syndrome, AEAb IgG, ATEAb IgG, risk factor. Please cite this article as: Mekenyan E, Stancheva N, Tisheva S. CHANGES IN THE IMMUNOLOGIC MARKERS OF ELASTIN DEGRADATION IN SUBJECTS WITH METABOLIC SYNDROME. J of IMAB. 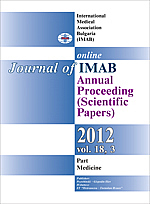 2012; 18(3):345-348. doi: 10.5272/jimab.2012183.345. 11. S. Tisheva. Changes in elastin degradation immunological indices in patients with moderate arterial hypertension maintained on systematic antihypertension treatment. Biotechnol&Biotechnol Eq. 2005 Sep;19(3):149-159. 15. Nicoloff G, Christova P. Elastin degradation products among obese children with family history of arterial hypertension. Diabetologia Croatica. 2003; 32(1):25-27. 21. Bako G, Jacob MP, Fulop T Jr, Foris G, Leovey A, Robert L. Immunology of elastin: study of anti-elastin peptide antibodies by DOT immunobinding assay. Immunol Lett. 1987 Jul;15(3):187-192. [PubMed].